The saloon cowboy is depicted in both movies and books. It is the Old West that made them the icon that they are today. Saloons were common in mostly all cities yet there were a few areas that already had Mexican style cantinas. Saloons mostly looked the same throughout the west. They had the common wooden front with a wooden boardwalk. There were always a few hitching posts to tie a horse. Often times a water source would be located close by for horses to drink. The front doors always consisted of two swinging doors, that would brush up against a cowboy as he walked into the main bar area. The bar itself was very long to accommodate many standing customers. The floor area consisted of wooden tables and chairs. 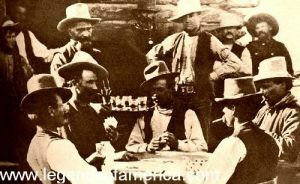 It was common to see a group of men playing a friendly game of poker or telling long stories of their travels. Most of the violence started in the saloon and at times emptied out into the roadway. 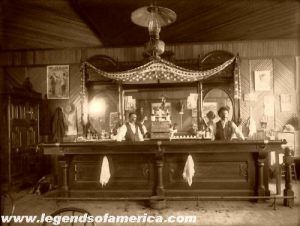 The first saloons to open were not the typical saloons that we all know from the movies and books. They were mostly tents or a square wooden structure with tent material thrown over the top. The material was enough to keep the rain off the heads of their costumers. The floors were not made of wood. Tent saloons never had floors of any type. If it rained the floors were muddy and if it was dry they were dusty. The only thing the early saloon offered was whiskey and a place to sit and rest. The first whiskey ever served in a saloon was not the fine whiskey that New Yorker’s or those from Chicago would sip. This stuff was raw and made right in the camp or town. The simple ingredients included raw alcohol, sugar burnt and a little pouch chewing tobacco. Whiskey with terrible names like “Coffin Varnish”, “Tarantula Juice”, “Red Eye” and others were common among the early saloons. Later the word “Firewater” would be used to describe Whiskey. It took on the name during trading with Indians. To explain what Whiskey was to the Indians, the cowboy would pour it over the fire to show its potency. With a high enough proof, Whiskey acted like gasoline on the fire. Soon firewater was the name of the drink. If you were a light weight and sipped your whiskey, you could be certain to find yourself drinking a 5th of Whiskey at gun point. Sipping was considered a weakness and not tolerated! Beer was not as common as whiskey, yet there were those that drank it. Since pasteurization was not invented yet, a cowboy had to take his beer warm and drink it quick. If not, the beer would get warmer and go flat. Whiskey kept its taste and potency no matter the temperature. It was not until 1880′s that Adolphus Busch invented artificial refrigeration and methods of pasteurization to the brewing process. Soon after Budweiser launched as a U.S. national brand. In the late 1820′s, Bent’s Fort, Colorado opened what we know as the first saloon in the west. 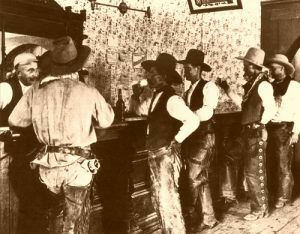 There were a few little towns which already had cantinas, but they did not compare to saloons that would soon spread like wild fire throughout the west. Striking gold was a big indicator that a saloon would pop-up in that town. In 1848, Santa Barbara, California only had one cantina. Yet after the discovery of gold, the town soon grew to 30 saloons. 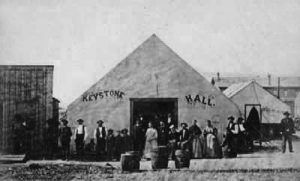 Towns like Livingston, Montana, with its 3,000 residents had no less than 33 saloons. Back in those days, it was easy to open a business. Innovation and growth was on the incline. Saloons were profitable and with a large customer base. About the Author: Born and raised in San Diego, California, Art Saborio has always had a passion for family, writing, history, gaming, and law. As he grew up, his interests also expanded into international travel and photography. Art describes himself as a family man with a desire and interest to help others. He is married with children and enjoys traveling the world and writing. He also runs several websites. Click here to find out more about the saloon cowboy. The saloon cowboy provides a look into how the west was born.